This started off as a weary rant from me today and then changed tone as the day progressed! While it has been exciting and encouraging to see the increase in coverage of child to parent violence and abuse in the media over the last week, I have been disappointed yet again by the tone of some of the pieces and the apparent laziness of reporting. 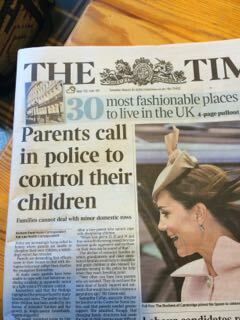 The main headline in the Times, (you may not be able to read the next line, “Families cannot deal with minor domestic rows”) today picks up on the report from Her Majesty’s Inspectorate of Constabulary into the welfare of vulnerable people in police custody, which has held centre stage across the media today. This highlights the often inappropriate use of custody for individuals experiencing poor mental health, or other vulnerabilities, because of a crisis in other support services; and while researchers have said that the findings show pressures faced by many families and carers, and the fact that the police are often used as the agency of last resort, the first example given – thus setting the tone – is of a dispute over a TV remote control. Other examples are given of greater severity of risk and violence. Parents are described as contacting the police because they reach breaking point. But there is no exploration of this issue in a wider way, other than to suggest lone women are finding it particularly difficult to bring up children. In a similar vein, a piece from the Global Times caught my attention, not least because it reports on experiences of child to parent violence in China. As you read on it becomes clear that the screening of My Violent Child in Britain has been a springboard for the article, which genuinely struggles to come to terms with the emergence of the issue in Chinese society; and yet the picture chosen to illustrate it and the first story are of tiny children, giving it more of a novelty feel. On a happier note (if that’s OK to say in this context) I want to commend Nicky Campbell for the discussion programme on Five Live Breakfast this morning. He enabled parents and professionals to share their deeply personal experiences of violence and abuse from children in a way that was sensitive and supportive. Such a shame that other agencies are recommending parents should call the police because they themselves fear for their safety and there is nothing they can offer themselves. Further radio programmes around the country have covered the same story today and I know that many have been privileged to speak as “experts” as well as the many families calling in. The day ended for me with a brief slot on Eddie Nestor’s Drive Time. Back in January 2014, Eddie ran a similar discussion and promised then to do further investigation. Good on you mate! I very much hope I will have a more positive mindset for my next post! Thanks for your support and your comments Colette. It is always good to know I am saying something useful!